The CTTP student teacher’s dormitory has been completely renovated. Beginning in September 2018, renovation completely finished in November 2018. We are going to have an official ceremony opening in the upcoming January 2019. Currently, this building is used for various purposes – the ground floor for demonstration school, running 8 classes and 1 library. The first floor contained 6 rooms used as the subject‐class for our student teachers while the second and top floor are used for accommodation and kitchen. 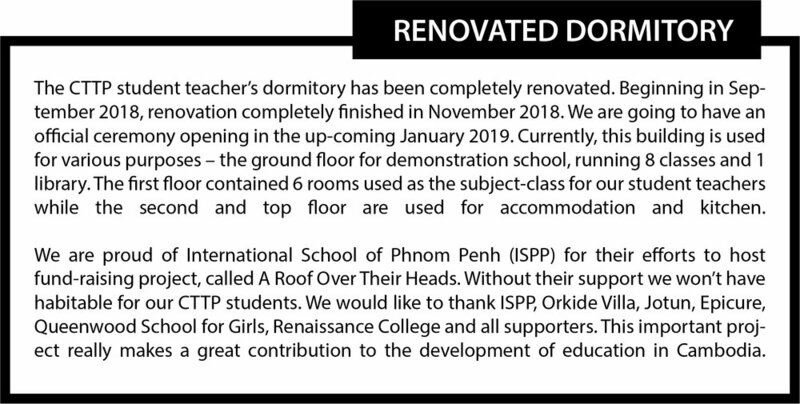 We are proud of International School of Phnom Penh (ISPP) for their efforts to host fundraising project, called A Roof Over Their Heads. Without their support we won’t have habitable for our CTTP students. We would like to thank ISPP, Orkide Villa, Jotun, Epicure, Queenwood School for Girls, Renaissance College and all supporters. This important project really makes a great contribution to the development of education in Cambodia. The English reading books for primary level donated by International School of Phnom Penh (ISPP) have been distributed to our student teachers. In total, a number of 1162 books were given to 69 student teachers. All these books are very useful because it can improve the reading skill of our students. Miss. Alyson Morgan, International Programs Coordinator from Queenwood School for girls led 15 students to visit CTTP school projects. By that time, they also taught a lesson about the solar system to our pupils. 480 students and 12 teachers participated while the pupils from grade 4 to 6 were selected for this lesson. The CTTP teachers expressed that the activities that taught by the girls were very interesting because they have interactive materials plus good teaching methods which made the students able to understand the lesson very easily. In the session with our student teachers, we introduced them how to produce a dice. The objective of this session is to motivate student teachers to produce low cost teaching materials. Dice plays very important role in educational game it can be played during recess time either in the whole class to strengthening the knowledge of pupils.